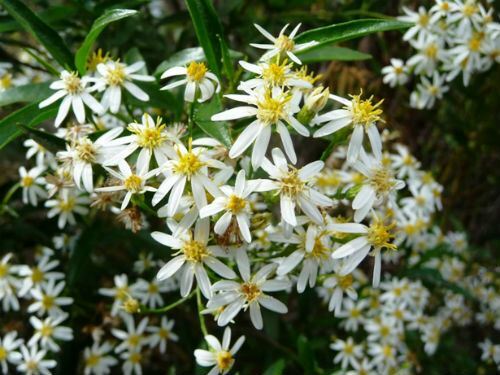 Olearia elliptica is known as the Sticky Daisy Bush. This medium shrub has elliptical, alternate, dark green and very sticky leaves. The foliage has an enamelled appearance. Plants carry masses of white daisy flowers in terminal clusters during summer and autumn. Prune lightly after flowering to prevent plants becoming dishevelled. Both foliage and flowers are attractive features. Olearia elliptica would be an interesting addition to a native shrubbery. The Sticky Daisy Bushis common in the bushland surrounding our cold climate garden. Olearia elliptica is also found in eastern New South Wales and southern Queensland. Olearia elliptica subsp praetermissa is confined to Lord Howe Island. The type specimen was collected in the Illawarra district, south of Sydney in the early 1800’s. At this time the species was known as Aster ellipticus. Propagate from cuttings that strike rapidly. This is a characteristic shared by the majority of Olearias. Olearia viscidula is another Daisy Bush that is found in our local bushland.